If you cast your minds back to last week you'll recall that I spent a pleasant but futile hour with Tim at a remote level crossing near Leiston waiting for the Class 950 test train to take a sortie down the Sizewell branch. How I cursed when this morning my alarm rudely dragged me from my slumber to announce it was precisely a week since it had woken me to go test train chasing. However I had clearly forgotten to deactivate the alarm for a reason as I found multiple messages from Tim telling me another effort was being made to go down the branch this morning, this time with a Class 57 loco. 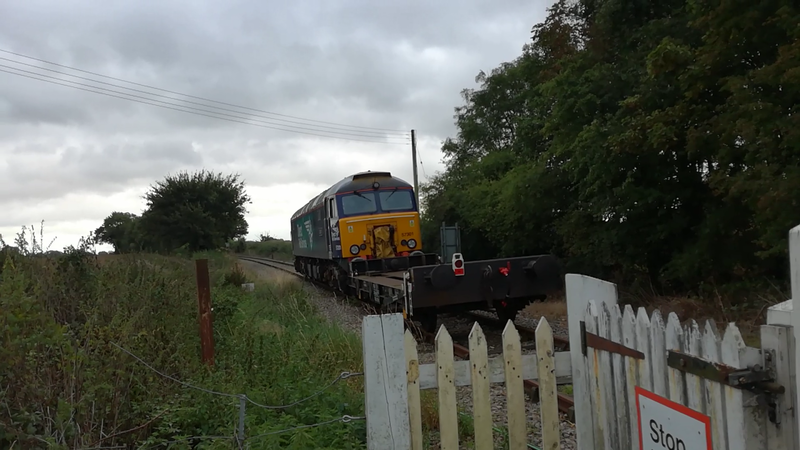 And so a repeat journey was made to Saxmundham first, where this time I made sure I was on the right platform to get the best view of 57301 and token trailer arrive. Some of you may be wondering what the odd coupling at the front of the 57 is for. The 57's are normally based along the West Coast Mainline at Wembley, Crewe, Preston/Lancaster and Carlisle and are nicknamed Thunderbirds as they are used to rescue Virgin's Class 390 Pendolinos when needed. The Pendos have strange couplings hence the odd looking fronts of the 57's. Anyway, again following in last weeks tyre tracks I headed down to the same crossing near Leiston, and set up camp again. The Sizewell Branch near Leiston - would Goliath make it down? This time all went to plan. After a tense wait I saw some lights in the distance and got ready. the first train down the line for roughly 9 months and almost certainly the first Class 57 to visit Sizewell. The member of train crew who had the job of jumping down and operating the crossings said this was just a run to keep the line open, and he hadn't heard of any increase in traffic on the branch, which is a shame, but we shall see. I did take another vid of Goliath heading off into the distance but unfortunately my memory card decided to run out making that vid is stupidly short, so here is a still from it. Thanks for the alert, Tim, and sorry you couldn't make it there yourself mate. 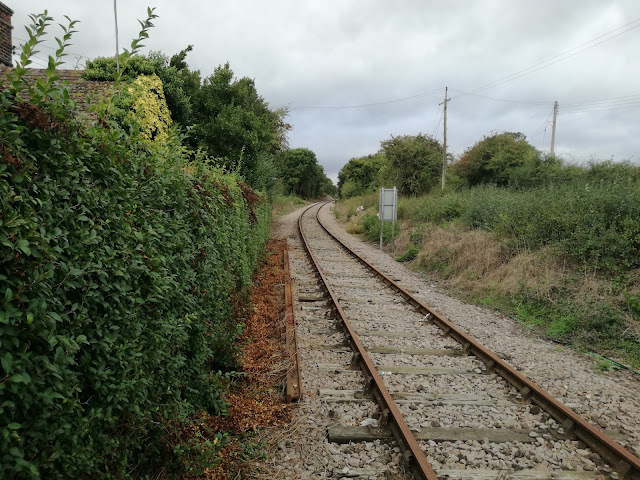 In Part One I reported how an aborted test train outing had resulted in a long and complicated journey to Norwich to get some bacon from the market. We left it when I had just arrived in Great Yarmouth on Borderbus's 580 from Bungay. 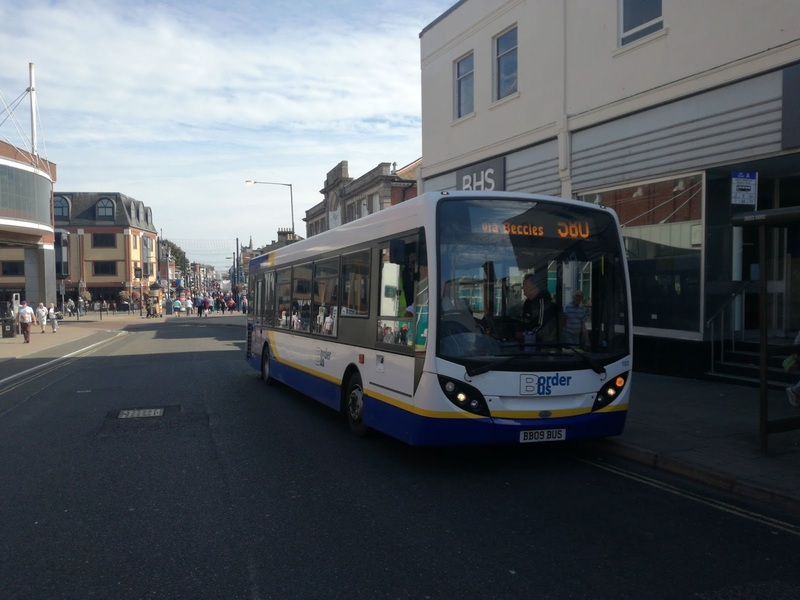 I had an hour to kill in Yarmouth as Borderbus have yet another E200 in their possession, and I hadn't seen it yet. Then I was sampling Konect's version of the 7 to Norwich for the first time. In the meantime I took the opportunity for a wander round Yarmouth as I had successfully avoided the town during the high season weeks. The lack of Plaxton Presidents was a joy, most have now been replaced with ex Leeds B9tl Gemini 2's, and it looks much better for it. Still getting used to the new stop arrangements there but I did manage to see a new service in the town, Our Bus's 271 to Hemsby, operated on by an increasingly rare breed in the area now, an original Optare Solo. 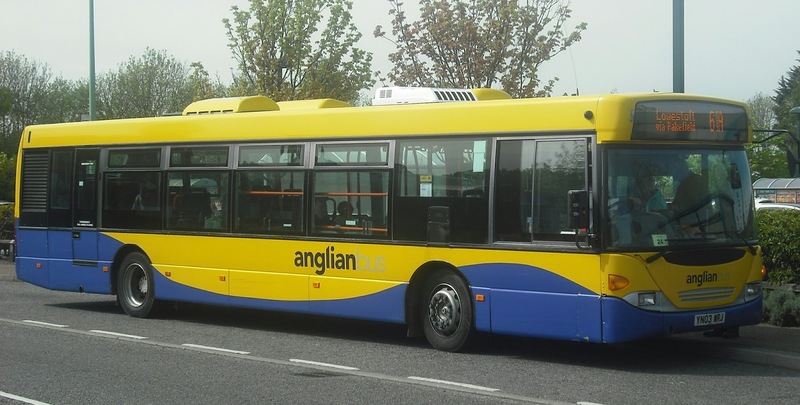 When Konect took over the 7 from Anglian it was launched in a blaze of publicity with a special livery, wifi, phone chargers etc. So naturally my first pic of a 7 was of a bus that had none of those! E400 602 SN10 CFF was deputising. Sadly I didn't get the pic of the new Borderbus E200, well I did but it was a complete disaster. However it is white, with Borderbus Vinyls, and an 09 reg E200. Not much imagination needed. I messed up the pic as I was walking towards the next 7 to Norwich, which this time was one of the branded E400's. The first time I had been on one of that particular batch of E400's too. Erm now what can I say about it. It was ok. I must be honest and say I prefer the E400's without air chill, which lessens the background noise. It was very spacious compared to the X1 with plenty of room to stretch out without being disturbed by other passengers. I noted we didn't pick up or drop off anyone at Postwick P&R which being only 1400 was fairly surprising. On the whole I had no complaints about the journey even if it didn't have me panting with excitement. It took me from where I was to where I wanted to be with minimum of fuss, it was comfortable, and got to Norwich on time. I guess that's all you really want from a bus service. For the record I had 638, SN65 OAX. And that was it. Bacon purchased - jolly nice it was too - and it was to Norwich bus station for the X88 back to Halesworth. Another gas bus, this time my old favourite 100, but again the condition wasn't how I want to remember it. I'm already saving up to go to Plymouth next Spring to see how Citibus have treated them. This brings me onto why I think they are going, having read between as many lines as possible. There has been some real rubbish spoken as to why the gas buses are going. I have heard that Anglian can't afford the lease anymore. Well they are not leased they are owned so that puts that one to bed. Secondly they cost over £30,000 a month to run. Rubbish - they are cheaper to run than diesel buses. Thirdly they are too big for the country routes. 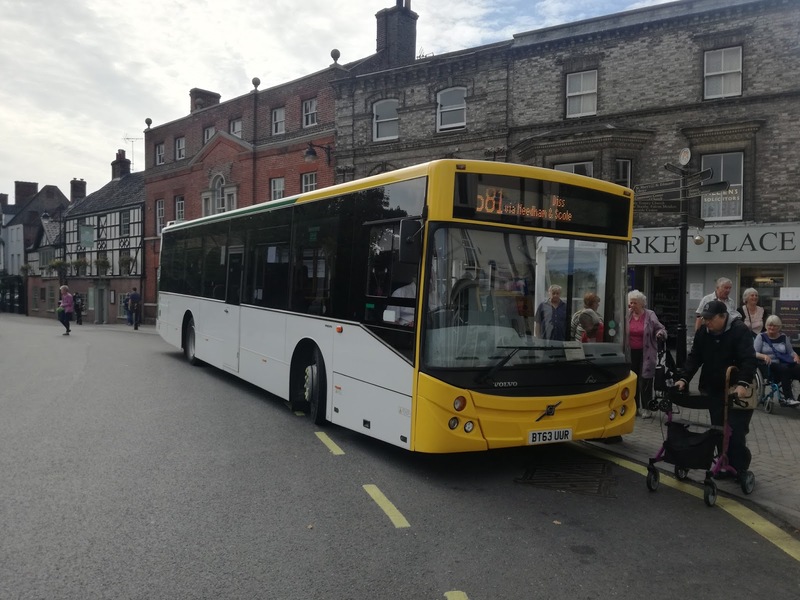 In recent weeks gas buses have been employed on the tightest of country routes including places like Topcroft on the 84 to Harleston, and are no bigger than the Scanias being refurbished to replace them. So what is the reason? You have to take a bit of everything, mix it up and reassemble it. Next year the 5 year warranty on the gas buses expires. 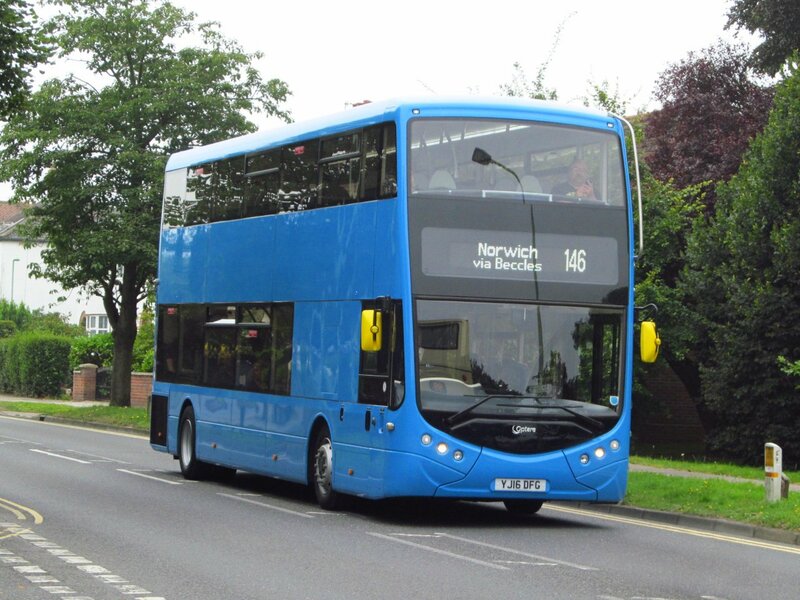 The country routes Anglian have do cause more damage than City routes do, including to the underneath of the buses, and MAN parts I'm told are not the cheapest in the world. Therefore it actually makes sense to use them in a location where damage will be reduced and therefore operating costs too. Scania panels are not difficult to come by but Ecocity panels aren't that common so without warranty I can understand why at the current rate of damage costs would go through the roof. I don't want to see them go but can now at least understand. However one question remains to be answered - Why the heck weren't we told that in the first place instead of being fed absolute rubbish about bus lengths and them being leased etc. Not good, and definitely not professional. Fnallly while I'm having a moan is there a worse advert for public transport in East Anglia than the Gents toilets at Norwich Bus Station. The loo in my flat is bigger, and in a far more hygienic state. The Gents at Norwich Bus Station are a disgraceful health hazard and cannot possibly encourage anyone to use public transport. Obviously I don't know what the Ladies are like but the Gents should be condemned. Those Portaloos were a darn sight cleaner. 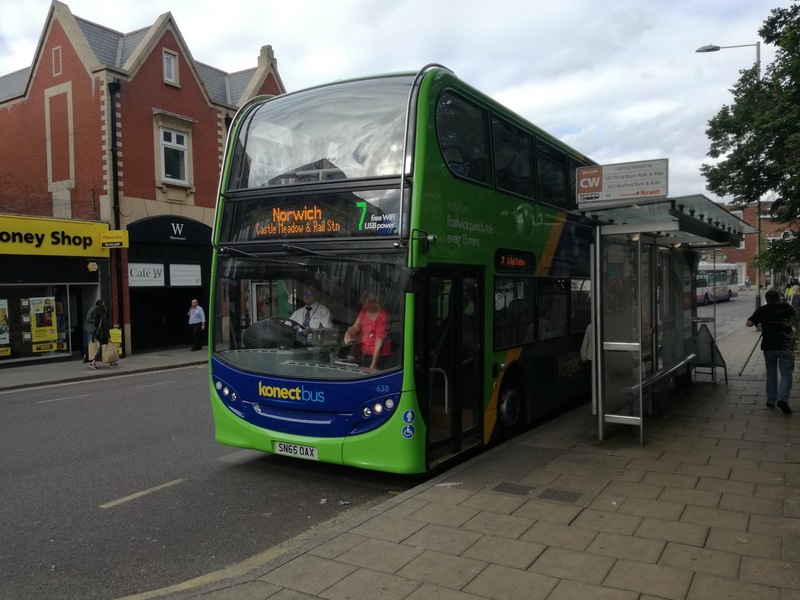 A couple of special posts coming up this week on the Carters.Ipswich Buses transition. Oh, and I passed Soames yard in Otley earlier today. Still looks busy, including a Suffolk Norse E300 over the pits. At the end of my last post I promised a bus post would follow, and so it has, ironically due to a points failure at Saxmundham. Allow me to explain. After posting my promise I noticed that yet another test train was in the area, and this one was a must. Not only is 950001 a one off train but it was going down the Sizewell branch, which now has a train down it about as often as a politician has an attack of conscience. A plan of action to catch it at as many locations as possible was formed, Tim managed to find some free time to join me at Leiston and we were all set. I decided to see her first at Saxmundham. 950001 is not, as some think a converted 150, but was purpose built for the job it does. I've called it the Baby Banana, and I didn't have long to wait before it came in, not on the platform I expected. I jumped back in the car and relocated to a country crossing on the Sizewell branch where Tim joined me. We waited, then waited some more. In the end I checked the diagram to see if it was still at Saxmundham only to discover it had turned round (metaphorically) and was already back at Woodbridge. It was not going to Sizewell after all. It later transpired that a set of points, presumably from mainline to branch, had failed and the Sizewell run will have to be rescheduled. So feeling very sorry for Tim who hadn't seen it at all it was back to Plan A, and I headed to Halesworth to start an extremely convoluted journey to Norwich. It won't be long before Anglian's gas buses transfer to Plymouth, therefore I was pleased to see one of them, 103, on the X88. I am unwavering in my opinion that these are the best single deck buses ever built, but I doubt I'd have reached that opinion had they always been in the condition 103 was yesterday. I have never heard more rattles on a gas bus before, and at one point the driver had to secure the cab door with sticky tape, well a ten trip ticket holder to be precise, to keep it shut. The distinct impression I got was "oh well they're going so we don't give a damn now". It's like seeing a dying relative in hospital - you try to remember them as they used to be, not as they are now. Plymouth will have their work cut out to get them back up to scratch. 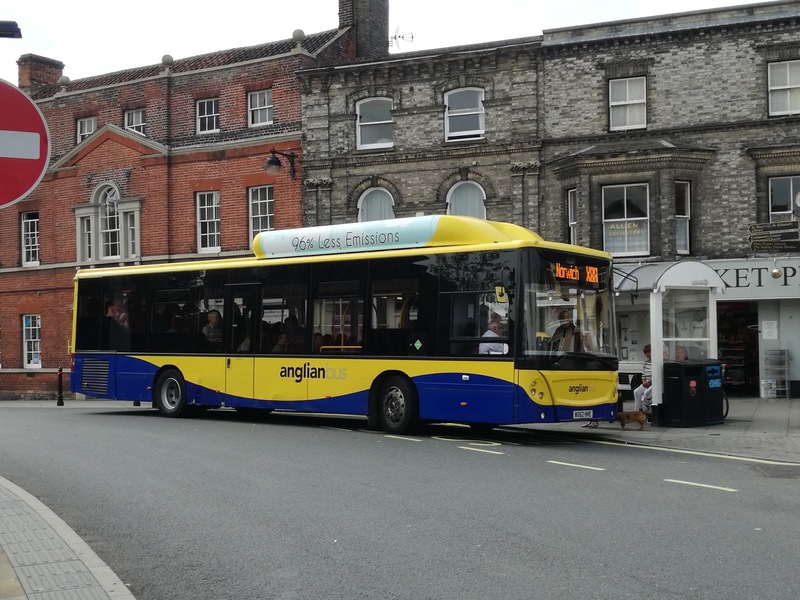 Bungay is quite an entertaining place these days, with Anglian, Borderbus and Simonds now serving the town. I had half hour there before catching the 580 to Yarmouth, and next up was the 581 to Beccles, operated by Simonds using one of their MCV bodied Vovo B7rle's. A few minutes later and a pleasant surprise. 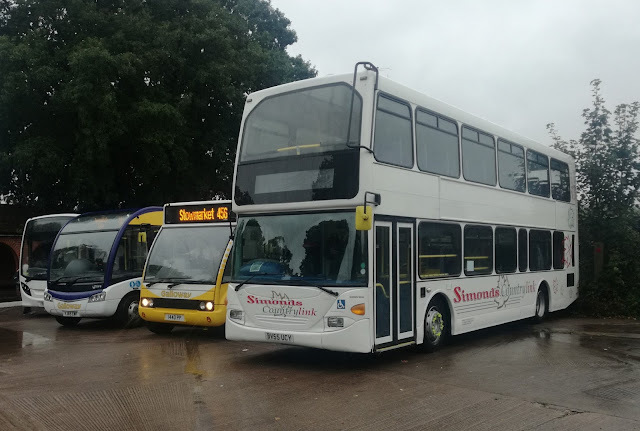 Last Friday I photographed Simonds latest double decker purchase at Diss, and yesterday I bagged their latest single decker purchase. BT63 UUR is an MCV bodied Volvo B8R formerly of Webberbus of Bridgwater. I say B8R as that was what the badge on the back said, however, it's listed as a B7rle so take your pick! Then my transport to Yarmouth arrived in the form of Borderbus 103, ADL E200 BB09 BUS. This was my first time on the route since Borderbus launched it in August, and it appears to be taking off really well. Other blogs have reported that Borderbus are using a double decker on the early morning journey, and speculated that it was in an attempt to lure students at Gorleston 6th form College on to the route. No luring required. That decker is needed as more than 50 students are using it to get to and from College. Not bad for a service that has only been running 6 weeks. I fully expect more journeys to be added to the timetable in due course, particularly a later journey in the afternoon. Anyway I suddenly realised I couldn't recall seeing a pic of a Borderbus vehicle at James Paget Hospital, so nipped out and put that right. Annoyed the destination screen didn't show on the photo, at Yarmouth I made sure it did. In Part 2 coming soon more from Yarmouth, and I finally arrive in Norwich. Unfortunately I have been forced to cancel my trip on Sunday so not as much bus material next week as anticipated. Sure something will turn up though. Hot on the heels of the PLPR test train to Lowestoft on Thursday came the ultrasonic test train on Monday. Totally unexpected but a nice surprise and it gave me something to do. So I met up with Tim and waited. 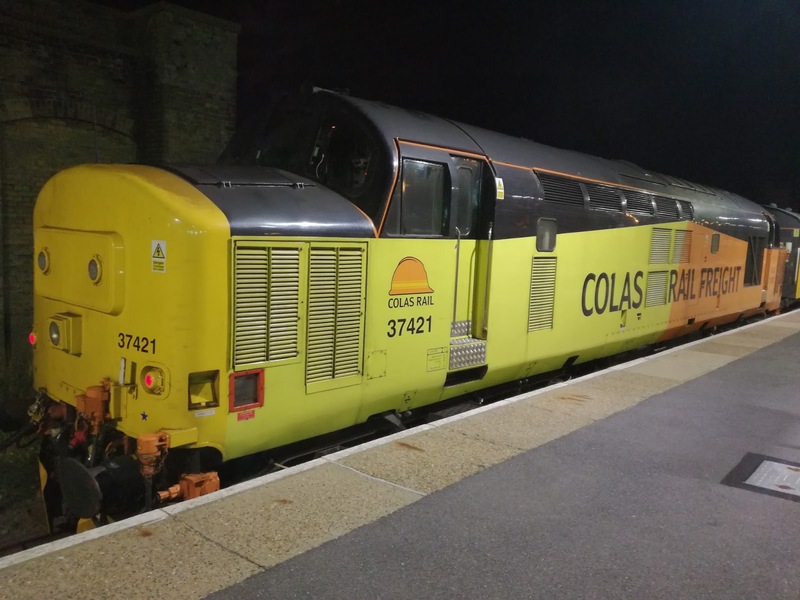 We knew what to expect - Colas Rail 37421 and a DBSO (9702) the other end. My first sight of a Colas Rail loco in the flesh and of course a 37 to boot. A few mins late and the magnificent loco loomed out of the Lowestoft light mist. I have to say the lighting at Lowestoft Station is exceptional, making night time videos and pictures a lot easier. I can't think of many stations where you could get a picture to match this one for example. The Colas livery is pretty divisive it seems, but I don't mind it at all. I think the old Anglia Railways livery, for example would look a lot worse on a 37 than this one. Anyway we were lucky in that the driver was another really friendly chap who was standing next to me when I took the above photo taking one himself. We asked if it was worth driving to Oulton Broad North to get some good engine noise but he told us not to bother as this particular test train measures at 20mph and there wouldn't be any engine noise! So we stayed put and videoed it leaving. Now you judge for yourself, but did that driver time the acceleration deliberately so we got the best sound effect? Certainly seems to me he coasts a little longer than most would before accelerating. It's little things like that which make the mileage worth it. And then came a bonus I wasn't expecting. Tim and I were nattering for ages by our cars, and many minutes had passed when I noticed a train in the distance approaching Lowestoft. Assuming it to be a 156 I didn't take much notice, then realised it was, in fact the Class 68 hauled short set making a very late night appearance. 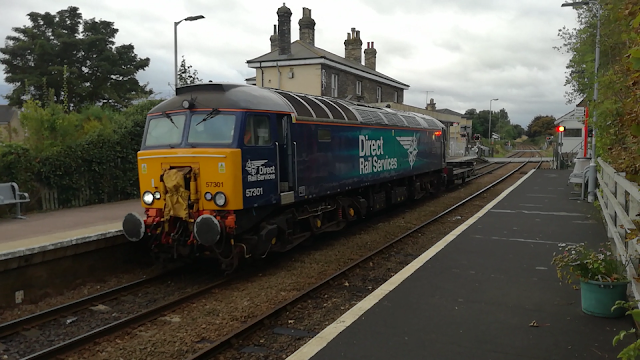 When I videoed it a few weeks ago 68016/19 were on it. Monday saw 2 different locos with 68022/24 on duty, in fact it turns out it was 68022's first day on the set. 68022 is the seventh Class 68 to have been employed on the set, which is now staying at least until the end of the year. The others having been 68004/9/16/19/23. My thanks to Richard Clinnick of Rail Magazine for that info. Unfortunately no major grunt from the 68's as they left ECS for Norwich, but what the heck we're just lucky to have them up here. An unexpectedly good evening, and thanks to Tim for the company. For those of you pining for bus posts fear not, the next week or so will bring several bus posts. Tim and I are on our travels Sunday, and there should be enough material to keep everyone happy! I'm also hoping to get to Norwich tomorrow, man flu permitting, and hope to catch up with a few things there..
A few weeks ago I suggested that First were about to concede a spectacular own goal, but at the time was not able to give details. Now I am able to reveal what I was talking about. Those of you who have been reading this blog from the outset will know when I started I was highly critical of First in just about all aspects of the operations. I was considered a "First hater". As it happened I wasn't, as I have proved by criticising anyone who warrants it. In the next three years three men have been responsible for turning First around, with amazing support from their junior managers and staff. These three are David Squire, former Managing Director who I believe is now plying his trade at Bristol, Chris Speed, who has transformed operations, vehicle presentation and on board revenue, and Hugo Forster who has masterminded Commercial activities. Thanks to those three First have transformed. So it was a shock when news reached me a few weeks ago that one of Chris or Hugo was going to lose their job due to management restructuring. There is a well known phrase which says if it aint broke don't fix it. Losing either Chris or Hugo is not going to be good. They are experts in their field and without them First would be in a very different position. Well the decision has been made. On Monday Chris Speed started his new position as Head of Operations at First Eastern Counties. I'm delighted for him and the future looks good for First. It also means I can nag him about certain issues which is even better. However I am truly gutted for Hugo Forster, who has given so much and played a massive part in rescuing FEC from the doldrums. He has accepted voluntary redundancy and I am confident he will be eagerly snapped up by another company, not necessarily in the bus industry, as in his favour Hugo isn't a bus enthusiast and so will survive quite happily in another industry. Thank you for what you have done for First, Hugo, and I wish you every success for the future. As for Chris, congratulations mate, so pleased you are staying with us, and I look forward to your random phone calls just to chew the cud. Good luck in your new role, which I'm sure will only benefit the travelling public of Norfolk and Suffolk. You'll soon hear from me if it doesn't!!! No other reason for the title than I'm writing this on a Friday evening. Two main topics tonight and undecided which order to put them in but think I'll go with the loud and garish first. 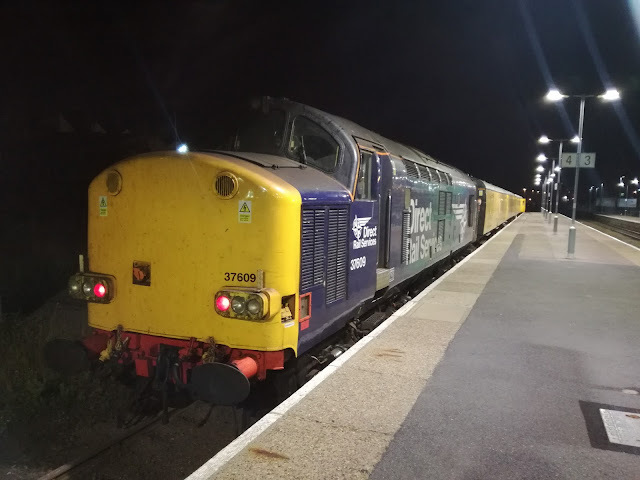 Last night saw me haring around East Suffolk as another Network Rail test train was in the area. Officially the PLPR in PLPR Test Train stands for Plain Line Pattern Recognition. Unofficially (meaning I've just made it up) it stands for Proper Locos Proper Racket and I wanted to hear as much racket as possible. Two 50 year old 37's were on duty, in far better nick than this particular 50yo, and pleasingly were different to the two that were on duty last month. This time I wanted a closer look so was at Lowestoft to see them come in. This was the first time I had got close up to a test train and thanks to the outside darkness I was able to see inside one. There only appeared to be two NR staff on board but what they have in front of them looks like a TV production gallery. 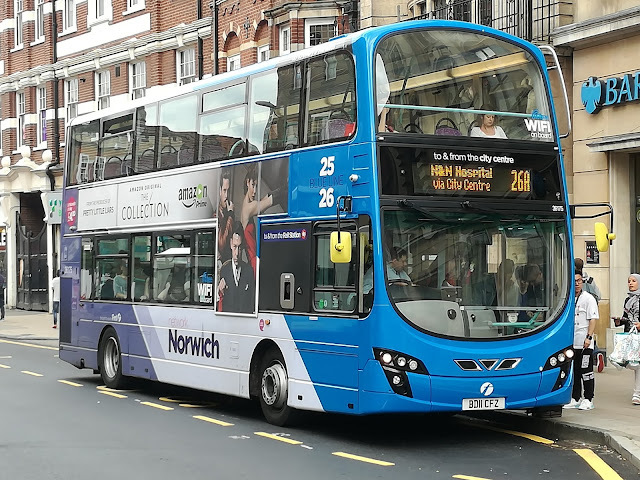 I had the opportunity to chat to the friendly driver who after first being rather uncomplimentary about the 37's ended up agreeing that they weren't that bad after all. He told me about the various test trains at Derby. This PLPR can measure to speeds up to 70mph, the "Flying Banana" and a Class 68 hauled one can measure up to 125mph, but another one that normally has a 37 one end and a DBSO the other can only measure at 30mph, and those duties can get a bit tedious. I told him I was heading to Darsham and could he put on a show when he pulled away. He informed me there was a driver change at Beccles but he would pass the message on. I left him in peace to have the rest of his break and took a couple of pics of the two locos, 37602/9. 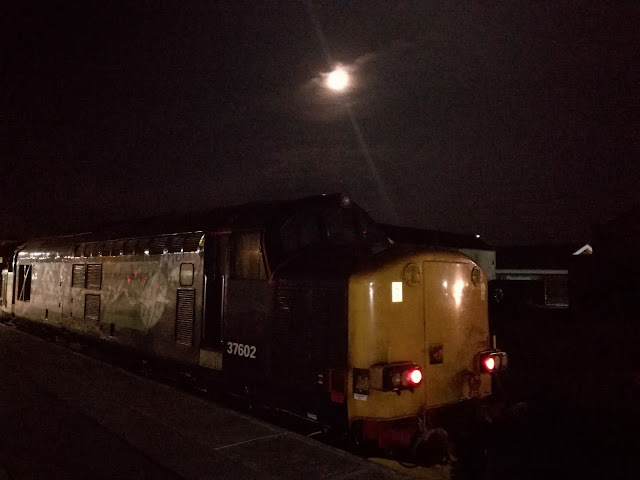 37602 was in the dark so this moonlit shot turned out reasonably well. At the other end 37609 was bathed in light, and proved a perfect model. Since the train was on the little used Platform 4 I thought it appropriate to video her leaving from the even less used Platform 1, which is now a car park! It was then time to hot wheel it down the A12 to Darsham, and see if my request for a show had been passed on. I think it's safe to say it had. This simply has to be heard over headphones. Both of those magnificent locos at full power. I honestly can't think of a better sound on the railways and they are British, and half a century old. Enjoy. Moving on and you will have noticed that over the last couple of years I haven't been exactly complimentary about Go Ahead's management of their companies in East Anglia, particularly Anglian. I have always stressed my issues have not been with Anglian themselves, but Go Ahead's running of Anglian. Well it looks as though the disease is spreading. 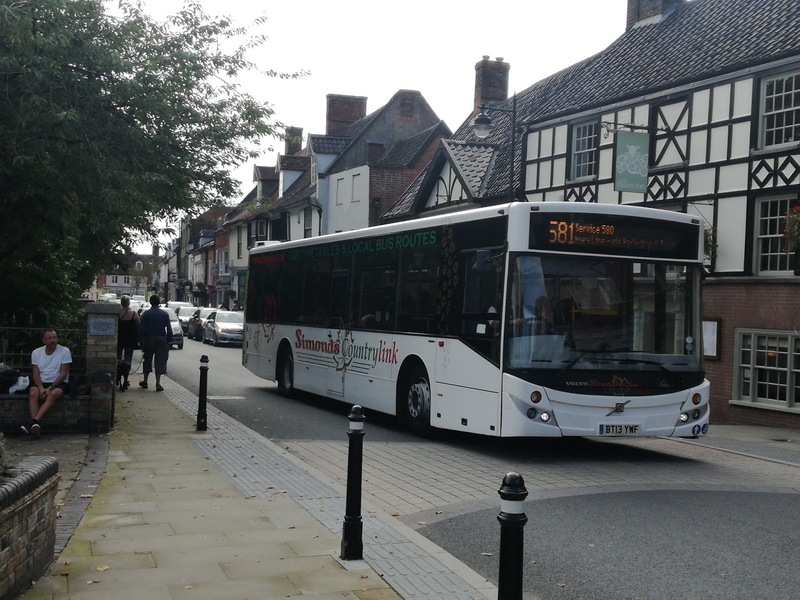 There have been many cancellations on both Hedingham and Chambers this week due to driver shortages. This afternoon the following statement from Hedingham appeared on Spotted Brightlingsea Facebook page in response to passenger complaints over the cancellations, and was published on Essex Buses Yahoo Group. I'll let you draw your own conclusions. and delays on our Route 87 over the past two weeks. have enough people to run the full timetable service. publishing a list of cancelled services on Twitter. bringing in agency drivers as soon as we are able. shifts – to keep the full service running. Gavin Hunter | Managing Director - Go East Anglia "
Finally I went shopping in Diss earlier today, and as luck would have it managed to spot Simonds recently purchased Scania Omnideckka. I'm fairly certain it's the first decker I've seen in Diss Bus Station and is accompanied by two Galloway Solos, one of them being one of the new Solo SR's, and a Simonds E200. Fair to say it was a bit soggy in Diss. That's it for this week, have a good weekend. I don't normally do one off posts but making an exception today. Tim Miller published a pic on Twitter earlier which had me drooling a bit. 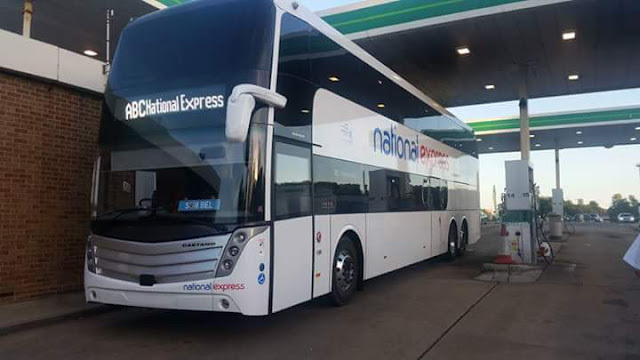 National Express are taking delivery of this Caetano Invictus bodied double decker which is certainly a head turner. I stand to be corrected but I can't remember NE having new deckers since the glory days of Rapide so this is certainly a new angle for them. It transpires, thanks to the efforts of Roy from East Norfolk Bus Blog that the National Express Invictus coaches are to be used on the London Victoria - Luton Airport service. I'm not a great fan of the Levantes so I will be interested to see what the ride on the Invictus is like. Added to my "to do" list. This pic was taken by Brian Madge of Parks of Hamilton, and all credit goes to him. Perfection doesn't sit easy with me - no not me personally - you couldn't get much further away from perfect than I, but on Wednesday I near enough described the blue version of the Optare Metrodecker as perfect, and that cost me sleep. No such thing as perfect after all, so yesterday I decided a further ride was necessary as after all I call myself a critic and I wouldn't be doing my (grossly underpaid) job if I didn't find room for improvement. The best double and single deck buses around together? Now at this point I should explain something. From just about the first time I went on a bus I decided the front offside seat upstairs on a double decker was designed specifically with my posterior in mind. In Kent at that time just about every decker had a 1+3 arrangement at the front of the top deck, and that single seat was mine. Atlanteans, Fleetlines, Bristol VR's all had that arrangement. 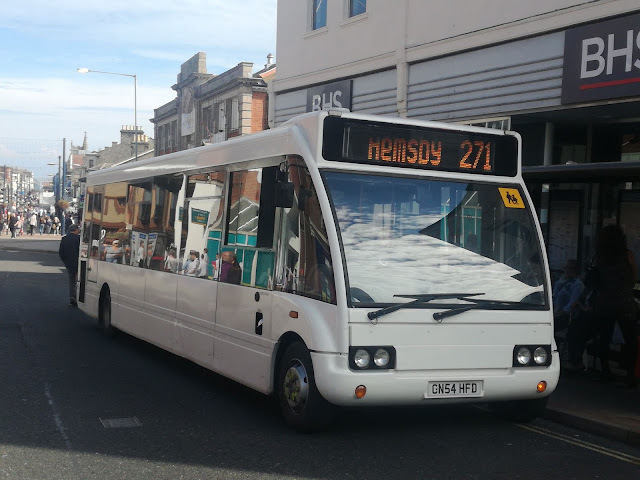 and Volvo Ailsas were even better with just a single seat and nothing else as the stairs brought you up right by the windscreen - Health & Safety would need medical assistance if that was to be suggested these days! But that ownership of the front offside seat still applies and it's where I test most of the deckers I review. On the Metrodecker it is a very pleasant place to be. I thought, however, I'd better see what the bus felt like sitting elsewhere, and last night I slept easier as I have finally found something I think can be improved. That something is noise. In my seat noise isn't an issue but go further towards the rear of the top deck and you suddenly become aware of the air chill system. It is very loud as the air is pushed through the length of the bus from the rear. Although the ride was just as good at the rear the noise was too loud and I wouldn't like that day in day out. The system also leads to additional problems. There are no ventilation/air chill outlets at the front of the top deck, and that causes the front to get pretty warm. This isn't helped by the fact the windows open. Yesterday one window was open which had the effect of pushing the chilled air back to the rear of the bus and the front got nothing. If air chill is going to be effective the windows need to be locked shut and only opened in case of air chill failure. Air vents are needed at the front too. 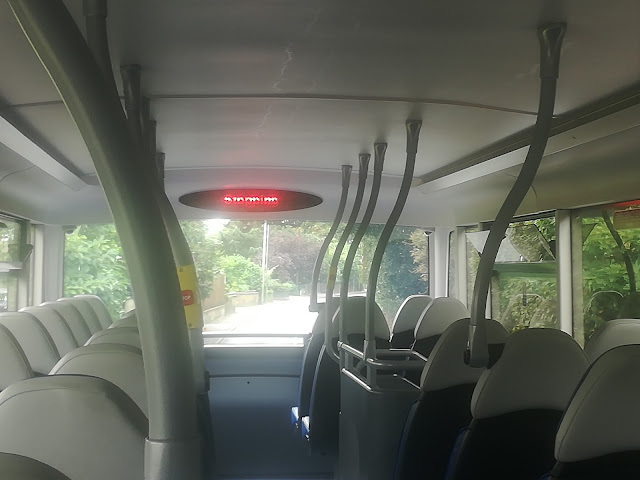 One other thing I noticed from the back of the top deck was this, and I promise you this is not my camera not capturing the image accurately - the "stopping" sign really does look like this. Now to that strange place known as the lower deck. All deckers are noisy downstairs, with maybe the exception of some Scanias, but I found the engine noise louder on the lower deck than I expected, as it's a relatively small engine. I suggest in the quest for lightness things like sound absorbing materials have been omitted, and I think this is a mistake. Optare have a potentially superb vehicle that could easily become a market leader, but noise matters. If passengers can't hear themselves talk then that is not a good thing. If memory serves me correct there is plenty of room in the engine bay for sound absorbing insulation, and I really think it's needed. The only other option is 83 front seats upstairs, and that might be a little more tricky. So reduce interior noise, both from engine and air chill system, and I'm going to struggle to find anything to criticise again! No rattles downstairs though, even from the driver's protection screen and that really is impressive. Incidentally when I got off at Pakefield I noticed just how windy it had become, which had not been apparent on the top deck. Another box ticked. 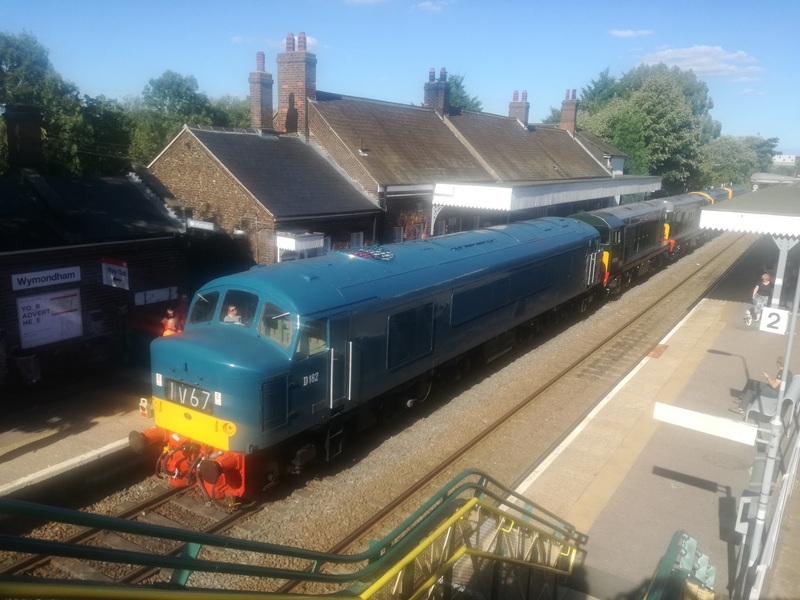 This weekend is the late Summer Diesel Gala on the Mid Norfolk Railway, and on Thursday I went to Wymondham with Tim to see the convoy arrive from Derby complete with no less than 4 Class 20's and a Peak Class 46. The sun was extremely bright which made photography difficult but this one makes the Peak look rather good. However to make up for the poor photographic conditions I did manage to get a pretty good vid of the convoy leaving National Rail territory and moving onto the MNR, including some rather nice Class 20 clag. Enjoy. Finally it has been confirmed that the Class 68 short set is to remain until at least December. Good news and hardly surprising as firstly 170204 is still being repaired and secondly it is attracting so many enthusiasts to the area it must be making a fortune. Don't be surprised if it's still here next Summer - I hope it is. If you cast your mind back 3 months you will remember Borderbus had on loan one of the two Optare Metrodeckers being evaluated prior to going into full production. If you didn't read my review please click here, and you will see pics of the orange Metrodecker, and also get the impression I rather liked it, with only one or two minor details I thought needed sorting. On Monday of this week out of the blue, literally, came the other Metrodecker demonstrator. This one has been on long term loan to First Yorkshire, and I was interested to see if it matched the standards set by the original. How long Borderbus have got it for no one knows so not taking any chances I jumped on it today for a ride between Pakefield and Norwich. 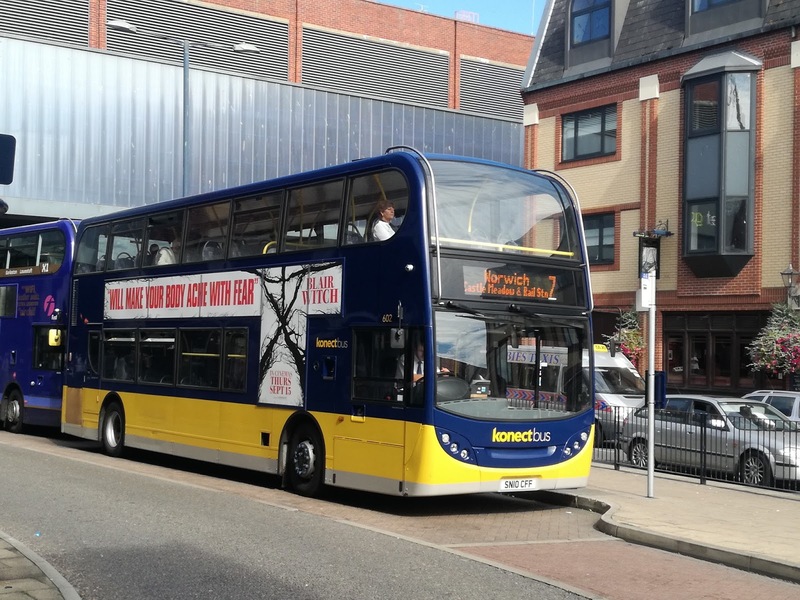 Not long after I had boarded I spied a certain Mr Grahame Bessey of East Norfolk Bus Blog taking a pic as we passed him and I'm pleased Grahame has sent it to me and allowed me to publish it. One thing struck me immediately about this particular bus - it pulled away faster than the orange one. Not savagely, but certainly quicker, which seems to have sorted one of my concerns with the orange one. The driver confirmed when we got to Norwich that the gearbox had a different ratio and that has made all the difference. Top speed was perfectly adequate but there is just no getting away from the ride of the Metrodecker. It is astonishingly good. I wondered if it would live up to the orange one which had me waxing lyrical but this one bettered it. 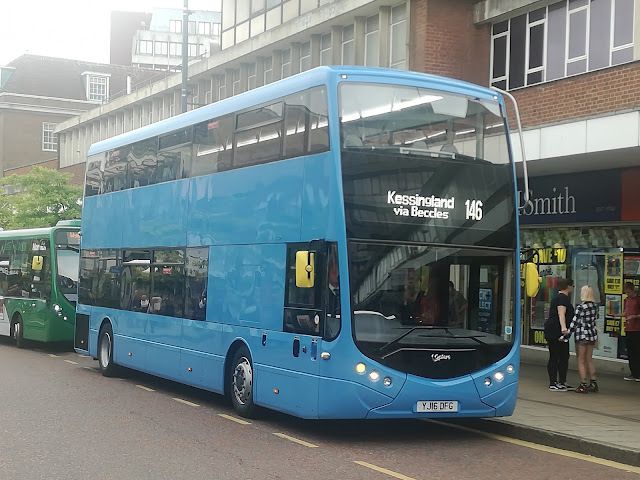 Having re-read my review of the orange one I compared it favourably to the Olympian coaches, and on reflection that is a little unfair as the Olympian coaches were built to coach spec. The Metrodecker is far better than any Olympian bus (yes I did just say that) so I need to compare the ride with another bus, not a coach. The nearest I can come up with is the Metropolitan Scania from the 1970's. That gave a ride head and shoulders above anything else in its day and the Metrodecker does that too. There are simply no rattles, which considering where it's been is quite something, it's as quiet at top speed as it is low speed, it feels solid despite being lighter than anything else and both I and a couple of other wise old enthusiasts, Richard and Dave, thought it outstanding. It also looks good from every angle inside and out. I don't often go out riding just for fun these days, but normally because I'm on a mission. I will be going out just to ride this bus again if it stays longer than this week. 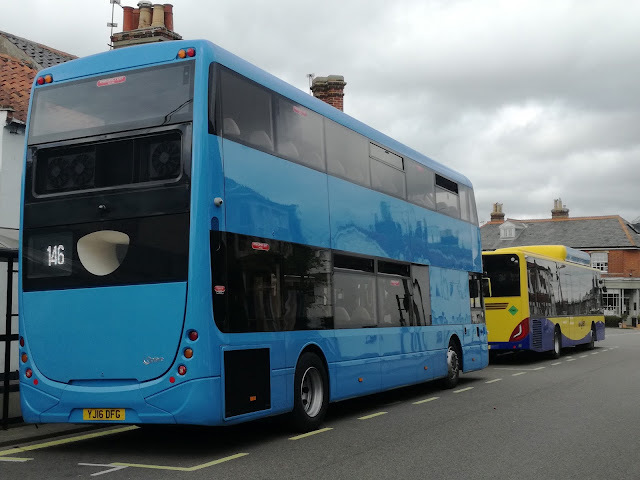 I understand Optare are currently working on addressing the suggestions raised to them by all areas of the industry, including I'm proud to say yours truly, and it is hoped Borderbus will be asked to evaluate the modified demonstrator later in the year. I can't wait. I said in my previous review that once all the little issues were corrected the Metrocity would be the best double decker on the market. I've got to be honest - I think it already is. A short week due to the Bank Holiday so nothing that is worthy of a single post, but quite a mixed bag of snippets, and I want to start with some good news for once after last week's rant! If you live in Kent, and I know a few of you do, then you will be well aware that the railway between Dover and Folkestone Central has been closed since January, when the English Channel did a pretty good demolition job on the sea wall at Dover, resulting in the line being closed ever since. It says something that Network Rail can't get their signals to work properly every day (of which more later), but can rebuild a railway to withstand the elements over 3 months ahead of schedule. They achieved it at Dawlish a couple of years ago and now Dover. The line officially re-opens to passengers on Monday 5th September but a few test trains have been on the line already. 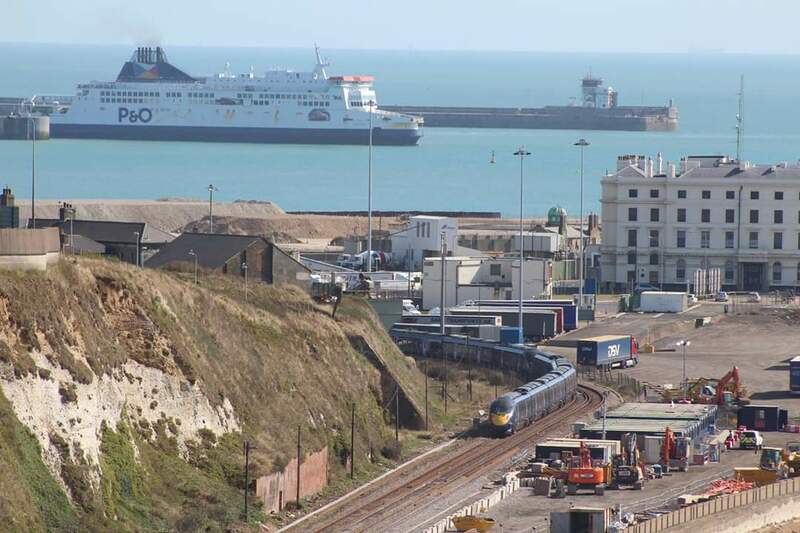 This picture was taken by Kelly, who has kindly given me her permission to use it here - what a shot of the Javelin on the rebuilt line curving towards Dover Priory, the P&O ferry and Dover in the background in glorious sunshine. Well done to all concerned in the rebuild and thanks to Kelly for the picture. This week saw the second phase of the Waveney Line bus route between Yarmout - Beccles - Diss take shape with the introduction of the Simonds operated 581 between Diss and Beccles, following the old 8 route. 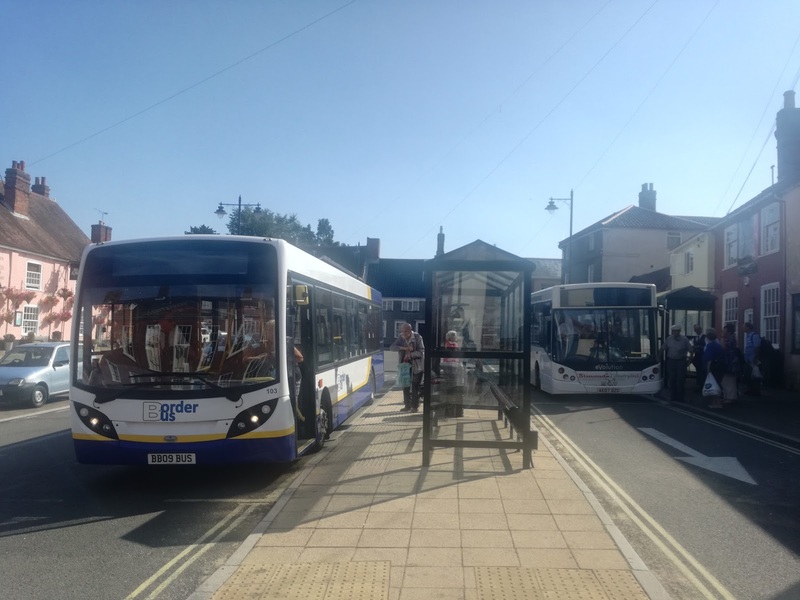 Initial information would suggest the route has been hugely popular already, and when I visited Beccles on Wednesday to observe proceedings it was encouraging to see the number of people not ony using the 581, but also the number taking advantage of the guaranteed connection with the Borderbus operated 580. 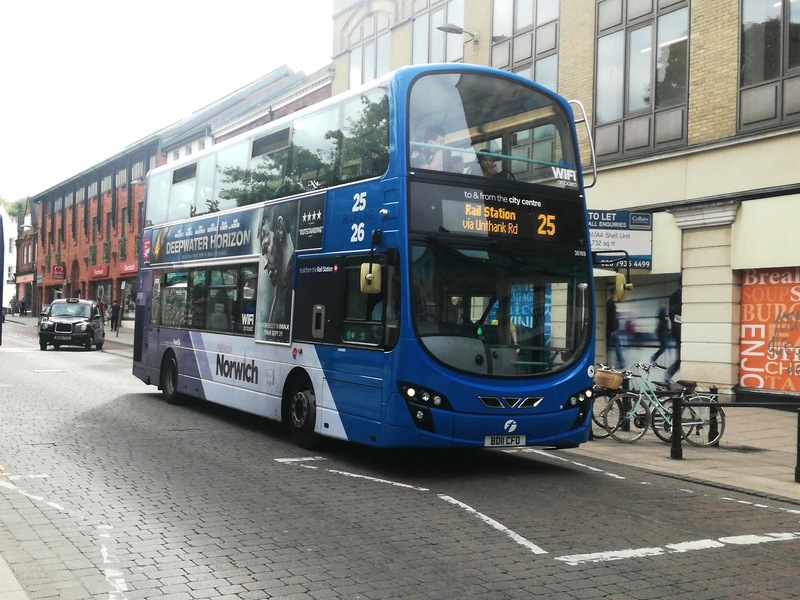 I wish both routes every success, and hope the public along the route force the operators into increasing the number of journeys through sheer popularity. 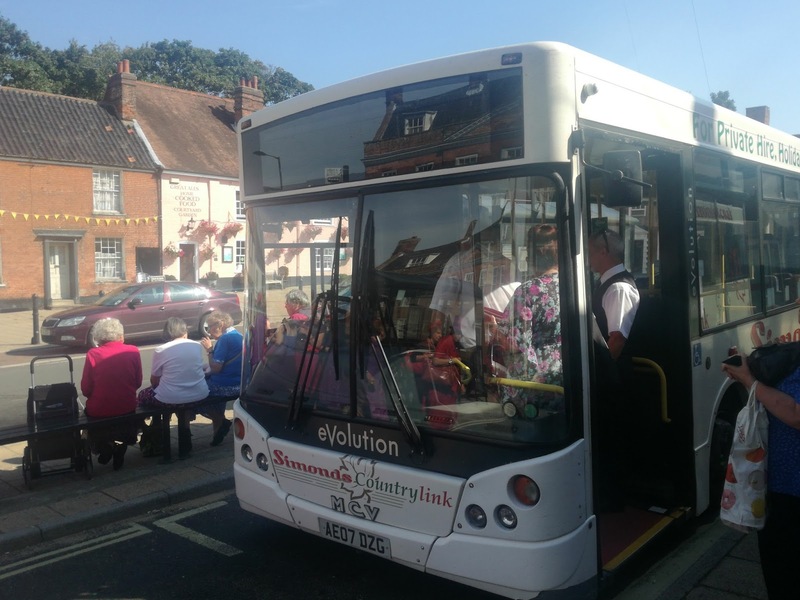 It was also extremely pleasant to see the Beccles Town Service being very well used. 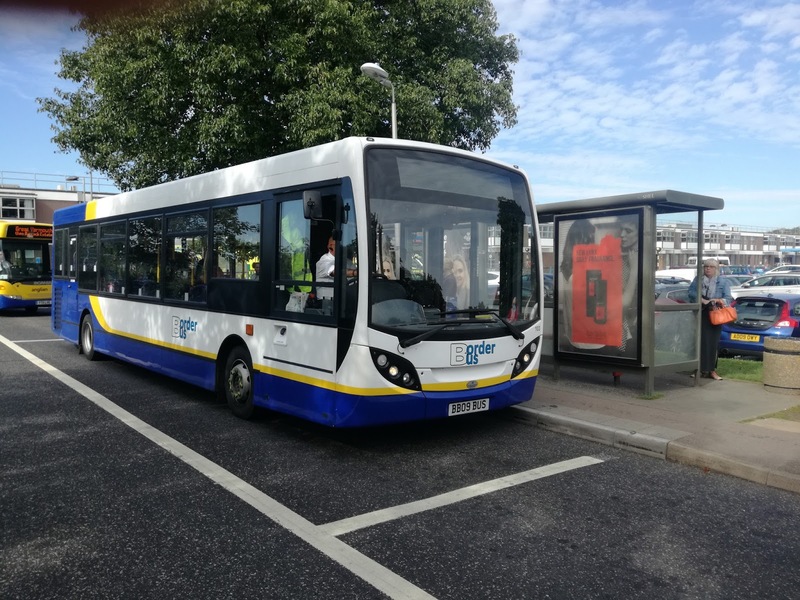 I understand the voluntary agreement between operator Borderbus and the residents on the route whereby occasionally free passes are kept in the pocket and fares paid to contribute towards the cost of the services is working well. If this continues long term then congratulations to both Borderbus and the passengers are well deserved. I don't know of another route with such a voluntary arrangement in place, and for those of you puzzled as to why Concessionary Pass payments are not enough to maintain the route I'm pleased to announce that Andrew Pursey of Borderbus has agreed to write a guest post explaining just that in the next couple of weeks or so. It's not as simple as you may think, with different Councils having different systems. It is never pleasant to have to report the sudden demise of a bus, but on Thursday Our Bus' E300 VAG 608R caught fire on the A47 near Acle and was unfortunately totally destroyed. Luckily the bus was empty, and the driver, the owner of the company, escaped without injury. There are pictures floating around if you search for them, but I've decided against publishing any. Now a little follow up from last week. It would appear my comments regarding window hanging enthusiasts were not welcomed by all window hanging enthusiasts, so I might just point out one thing. I was talking about public trains, such as the short sets where window hanging is illegal anyway, not heritage lines where the trains aren't going fast enough to affect ventilation, and as a rule Mark I stock is used which have opening windows in the coaches. You don't want a reputation, don't earn it. But there is a much more serious point. There is currently an inquest going on as to how a man was killed after his head was struck by a signal gantry near Balham in South London. It would appear the victim was trespassing in a guard's compartment on a Class 442 Gatwick Express train, and leaning out of a window which had a notice above it saying "Do not lean out of the window". When I first heard about the incident I rather assumed it was a person probably drunk showing off to his mates as I saw a thousand times in my time as a guard. But no. This man was a volunteer on the Bluebell Railway. If anyone should have known the dangers of sticking your head out of a window at 60mph it was him. I have extreme sympathy for his family, friends, those who witnessed it and had to deal with it, but none whatsoever for him. This is the precise region what is now Southern had bars put across the windows of VEPS in the 90's. I expect some person will anonymously very bravely call me names again for expressing my views but I stand by them. 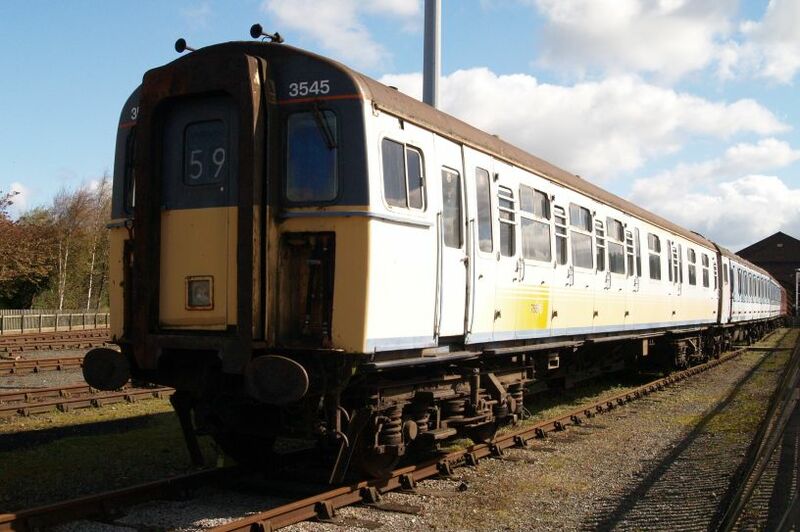 VEP with window bars - do we have to go down this road again? Finally this week following the various Twitter feeds it has been noticeable that signals have been failing in alarming numbers across the rail network causing untold thousands of minutes of delays. So I have this to ask of you more senior readers. How many delays to trains were there in the 1960's before the introduction of aspect signalling, when apparently average journey times were shorter for most journeys. 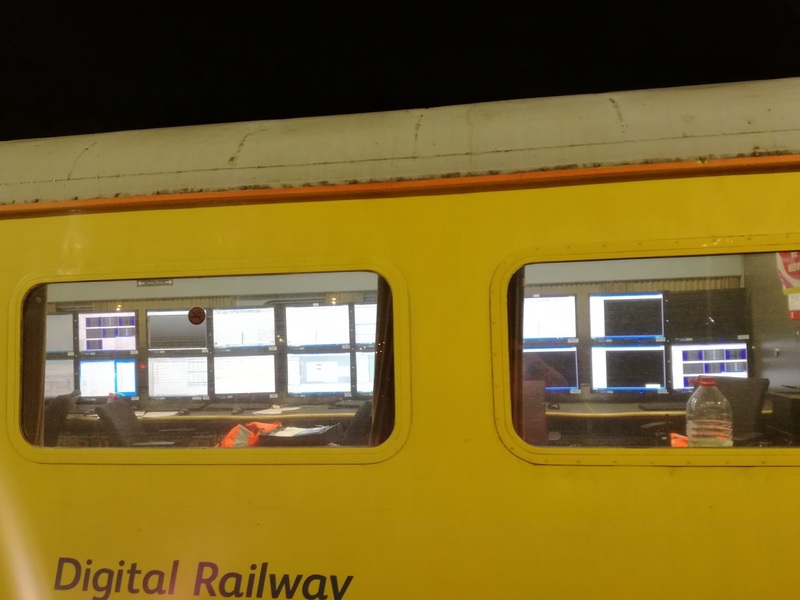 Should fines to Network Rail be higher for signal failures, and should there be a separate company/department solely responsible for signal operation/maintenance. Discuss. Have a good week everyone and don't lose your head.